British Heart Foundation (BHF) has a vision; for a world without heart and circulatory diseases. We have been running a series of campaigns to realise our vision by getting our heart health information and support to those who need it most. As a marketer this challenge is a dream to work on – how can we connect our health content with the people out there who really need us and how can we tailor their experiences according to who they are? Our first ‘conditions led campaign’ on high blood pressure launched at the end of November 2017. BHF has lots of information and support, a helpline and a free heart health magazine for people with high blood pressure. Our aim is to raise awareness of the risk of high blood pressure, inspire people to get it checked and make changes to their health. We also had key KPIs on increasing our reach and engagement on pages. In the planning stages of the campaign we quickly identified different audiences with very different needs. 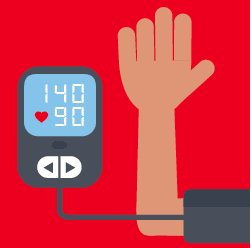 People who are at risk of high blood pressure need to get their blood pressure checked. People who have already been diagnosed need to start make changes to their lifestyle – quickly. Rather than directing them to our current high blood pressure page which caters for everyone, we wanted to prioritise the most important health message for each audience. Digital targeting then came into its own. Because we could segment our audiences so carefully, we were able to create three different personalised landing pages that offer the audiences the message they need. We used a marketing model (SEE, THINK, DO) to identify our segments. We used Facebook and Display advertising to reach our audience. We are very fortunate to have an internal creative team who produce some wonderful concepts, copy and graphics that our audiences love. We produced slightly different variants of the creative, depending on whether they were likely or not to have had their blood pressure checked already. As the campaigns are always on, we are able to test, learn and optimise using a more agile working approach. We quickly saw using tools such as Sessioncam that people wanted more information, and we made changes to the landing pages based on Facebook comment feedback. Our changes increased time spent on site by one minute! We’ve also used Facebook comments to give us further ideas of new content (for example content on low blood pressure) we can develop so we can better support people. Once the advert is shown to our audience segments, they are directed to personalised pages. Each of the personalised pages is specifically designed to speak to the segments motivations, and are therefore more likely to encourage their use of resources, engage with the content and crucially take action to support their own health need. We are working on back end personalisation so that in the future this personalisation will be hosted on one URL. We’re also planning to incorporate data capture on these pages so that audiences can sign up for tailored email journeys. We have reached over four million people with the campaign, 500,000 people have clicked through, with a 1% CTR (BHF benchmark is 0.10%) and 1.52% engagement rate (BHF benchmark is between 0.5-1.5%) and have increased traffic to high blood pressure content across the site by 72%. Through the high dwell time (1.46) and SessionCam heatmaps, we can see that people are engaging with the content in this campaign and are likely to be reading the whole page before going elsewhere or leaving the site. Exit surveys to be introduced on landing pages to monitor people’s likelihood to get their blood pressure checked and make changes to their everyday health. Becca is digital marketing executive for healthcare innovation at the British Heart Foundation. Becca has worked in the charity sector for the last eight years including marketing teams at Save the Children, Raleigh International and British Heart Foundation. Becca is passionate about using insight and creativity to drive forwards a positive message to audiences.